The following acts have warmed up or shared the stage at one or more of The Travelers' many performances. The Two Pot Screamers is a traditional Irish band composed of the extremely talented duo Jonathan Chai and Daryl Craig. Both play several instruments, with Jonathan mainly playing fiddle and concertina, and Daryl playing mainly mandolin and tin whistle. They are frequently backed up by Martin McIntyre of The Travelers on the bodhrán as well. 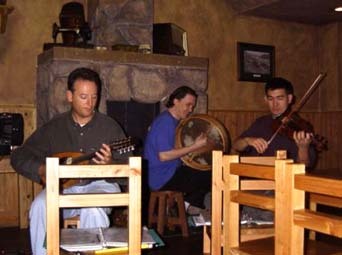 The band has attracted quite a following to their repertoire of jigs and reels, and plays regularly both at The Morrigan's and Double Decker, both pubs in Okinawa, Japan. These musicians have warmed up on several occasions for The Travelers, but the most fun comes when they jam together, especially at a spontaneous session! The Two Pot Screamers have played alongside other talented musicians from Ireland, Japan, and even members of The Magical Strings from Seattle, Washington. In the midst of his world tour, Guy Bescond, a Scottish Highland Bagpiper from French Bretagne, came to Okinawa for a one-night only performance at The Morrigan's. Mr. Bescond has toured with the traditional Celt troupes "Bagad Beuzeg" and "Baga Kemper," touring through Scotland, the Netherlands, the Czech Republic, Switzerland, Belgium, Austria, Germany, Portugal, Ireland, Spain, Poland, and other continents. At The Morrigan's, he played both solo and with The Travelers in a rousing night of Celtic entertainment. For more on Mr. Bescond's performance at The Morrigan's, see Guy Bescond - Bagpiper. For more on Mr. Bescond, his touring and French Bretagne, see www.antourtan.org. 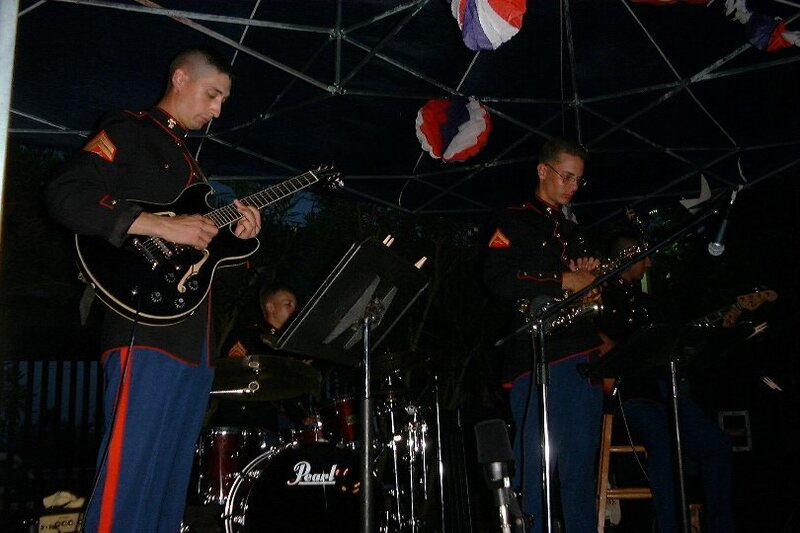 Several U.S. Marine Corps musicians from the Third Marine Expeditionary Force (III MEF) Band have formed a jazz band during their off-time. Playing mostly traditional bee-bop and swing, these talented cats have gathered quite a following in their short time playing together so far. For the April Hoolie, Mile Ahead warmed up for Mickey Mulligan and The Travelers, and on Independence Day at the American Consulate in Okinawa, Mickey shared stage time once again with this swinging ensemble. In fact, Mickey even sat in on keyboard for a few blues tunes! Ken and Sando are two jazz guitarists who play regularly in the Tokyo area. Ken plays the six-string classical guitar while Sando plays the six-string acoustic. Their repertoire extends from traditional American jazz standards to their own originals. Constantly trading off as rhythm or lead, they repeatedly attempt to outdo each other on their improvisation and lightning fast licks, much to the thrill of their audience. 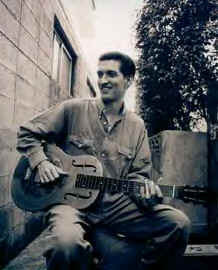 In fact, both Mickey and Rowan of The Travelers were heard to say, "I quit" after hearing these two phenomenal musicians..
Byron Jones is a renowned shamisen player and singer who despite being American by birth, has spent most of his formative years in Okinawa. Besides playing traditional Okinawan and Japanese songs, believe it or not, he also plays music as diverse as Louis Armstrong and Eric Clapton! 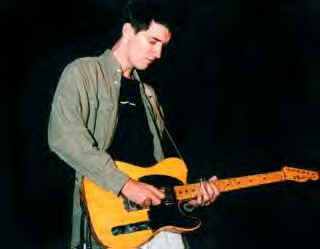 He is in wide demand, and frequently plays for businessmen, parties and other small gatherings. He is such a recognized talent that Japanese shamisen instructors often refer their own students to Byron when they have exhausted their own skills. He has warmed up before The Travelers on two separate occasions. FPO AP is a local Okinawan band composed of musicians of both local talent and America. The play cover tunes spanning several decades, and perform with a tight sound to the entertainment of crowds both on and off the military bases of Okinawa. The Chuck Wow Band is an excellent, if not loud, three piece American rock and roll band. The majority of their repertoire consists of seventies and eighties American tunes, although they also play nineties tunes as well. Consisting of guitar, bass and drums, their tight rhythms have entertained many service members and locals on the island of Okinawa. They have warmed up for The Travelers, and have played in several pubs and clubs. On New Year's Eve, they were the featured band at The Morrigan's while The Travelers were on their Millennium Tour in Southern California. The Nagayama Band is composed of four young talented Okinawan musicians who play American rock and roll. Despite English being his second language, the lead singer belts out tunes such as Roy Orbison's "Pretty Woman" and their tight sound keeps the audience tapping their feet to the rhythms. Although your initial impression might be a Beattles-look-a-like garage band of the seventies, the Nagayama Band has caused many an audience member to return to their performances. The David Ralston Band, led by the talented guitarist himself, is a blues band which plays frequent gigs throughout Okinawa, both on the military bases and out in town. They have warmed up once for Mickey Mulligan, and once for The Travelers.